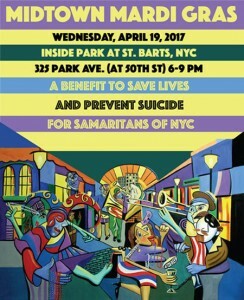 The Samaritans of New York thanks everyone for their support for 10th Annual Soirée. Donations and/or payment for auction items can be processed by entering the amounts HERE. 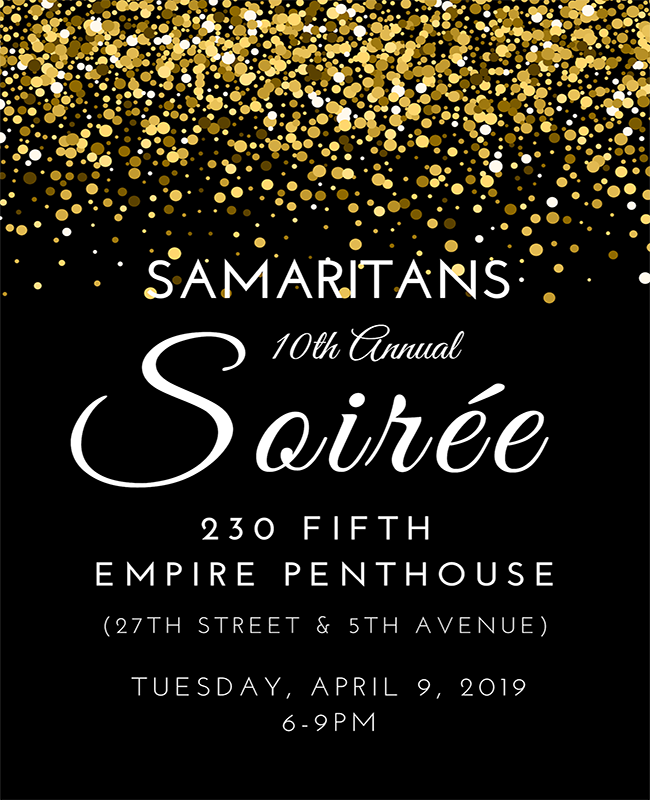 This year marks a decade since the board of directors of Samaritans Suicide Prevention Center embarked on a fundraising journey that has positively affected and supported the lives of so many people in need. We encourage all of the friends, supporters, and survivors who have played a crucial role in this decade-long journey to join us and share in our celebration. 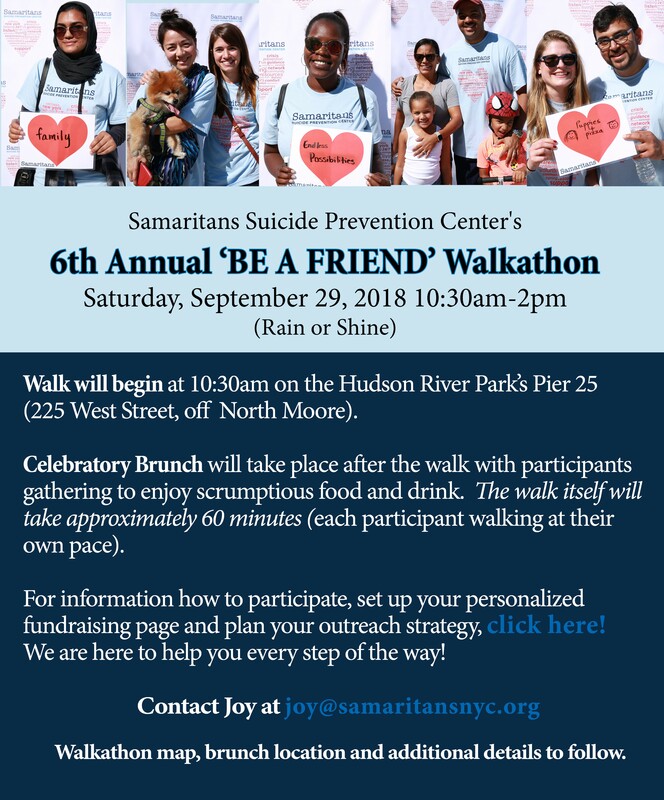 In today’s world it can be hard to know how to make a real impact, Samaritans Annual BE A FRIEND 5K Walkathon is the perfect opportunity to make a difference in the lives of New Yorkers in need! The Walkathon has proven to be an enjoyable gathering of like-minded people who come together as a caring community to promote the value of healing, helping and human kindness. 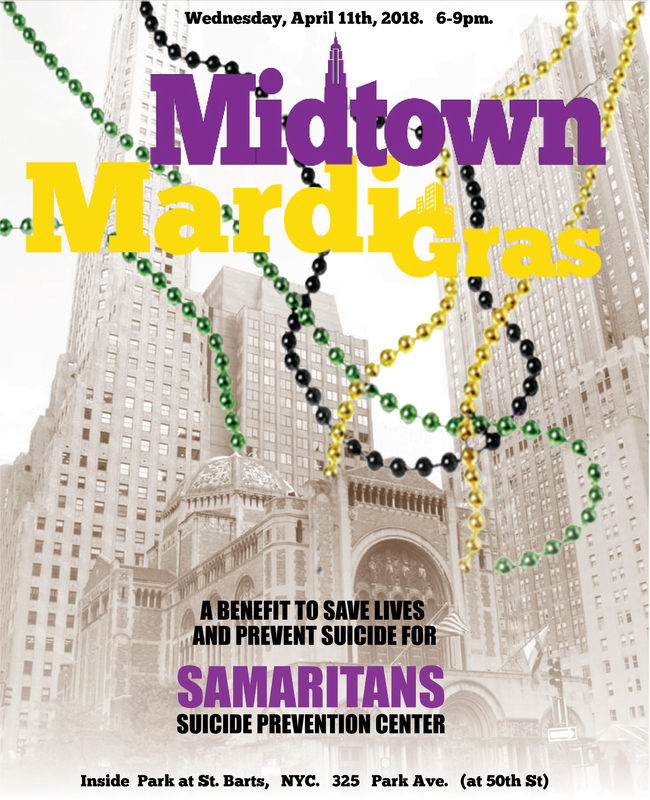 Samaritans Midtown Mardi Gras at St. Bart’s has become an annual event that no one wants to miss! Under the guidance of our Board President, Wes Puryear, it is a special evening of fun, good food, beautiful stilt walkers, magicians, a New Orleans jazz band, open bar and silent auction of art, travel, sports and entertainment packages that offers something for everyone. 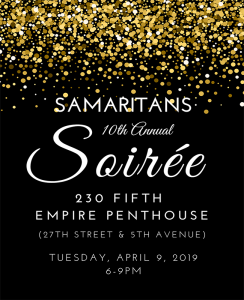 And it is all for a good cause, Samaritans Suicide Prevention Center, an organization that provides help and support to New Yorkers in distress. So join us and be part of the celebration! Buy tickets HERE. 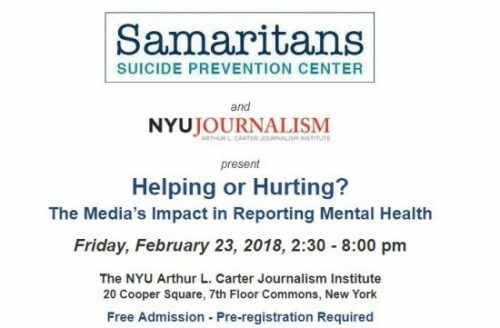 For those people who are concerned about the tragic violence that has become all too commonplace these days—and the sensational and graphic reporting that often exacerbates these events—Samaritans is inviting you to attend this free forum on “safe” messaging around mental health. 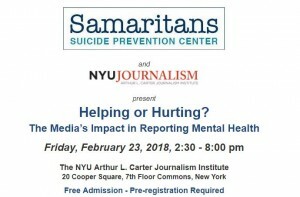 This event is taking place next Friday, February 23 at NYU in the Village. More information HERE. Samaritans has a limited number of guaranteed entries as a charity partner with the New York Road Runners for the 2018 United Airlines NYC Half Marathon. When you sign-up to run the United Airlines NYC Half Marathon on Sunday, March 18, 2018 as a member of Samaritans “Be A Friend” Team, you are taking an important step to help people in crisis and help save lives. Ready to join our team? Click here for more information! 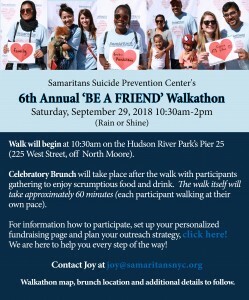 Join us Sunday, September 24 to support Samaritans Suicide Prevention Center’s work to help New Yorkers who are in distress and suicidal, and save lives. Our Annual 5K Walkathon is a wonderful opportunity for you to get the people in your lives involved in a cause you believe in! The Walkathon has proven to be an enjoyable gathering of like-minded people who come together as a caring community to promote the value of healing, helping and human kindness. For more information on how to participate, click here! 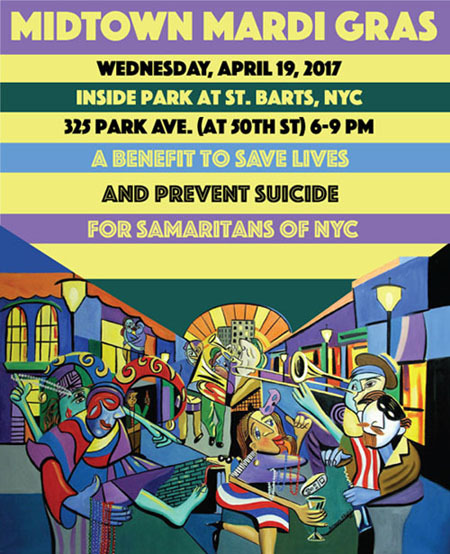 Join Samaritans Board President, Wes Puryear, Executive Director, JP Morgan Chase, and our friends and supporters for a special evening benefiting NYC’s Suicide Prevention Center and 24-hour Hotline at the festive Inside Park at St. Bart’s. 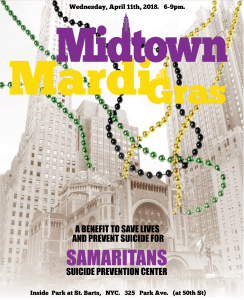 The Mardi Gras themed celebration includes: New Orleans Cocktails, Open Bar (6-8 pm), Hors D’ouevres, The Big Mamou Band, Stilt Walkers, Magicians and a Silent Auction featuring New York Nightlife, professional consultations, recreational experiences, vacations, art work and entertainment. To purchase tickets and make donations, click here. 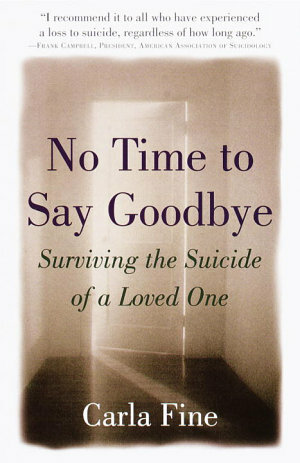 Samaritans is pleased to host our good friend, Carla Fine, author of “No Time to Say Goodbye,” in an evening of readings and conversation about surviving suicide loss. Providing insight, warmth and humor, Carla reflects on her own deeply personal experience of the loss of her husband and the stories she has heard from other loss survivors. 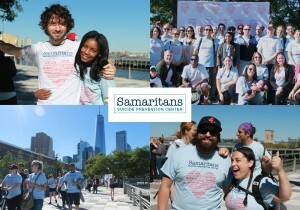 For suicide survivors, their families and friends, colleagues, caregivers and health providers. Readings, group conversation and Q & A. Light refreshments will be served. Attendance is free, but you must pre-register. Rob, Lisa and the Sprague Family invite you to the Freedom to Live Gala III, dedicated to the spirit and vibrant memory of Jordan Sprague whose star was rising at 19, but suicide prevented him from experiencing all of his tomorrows. 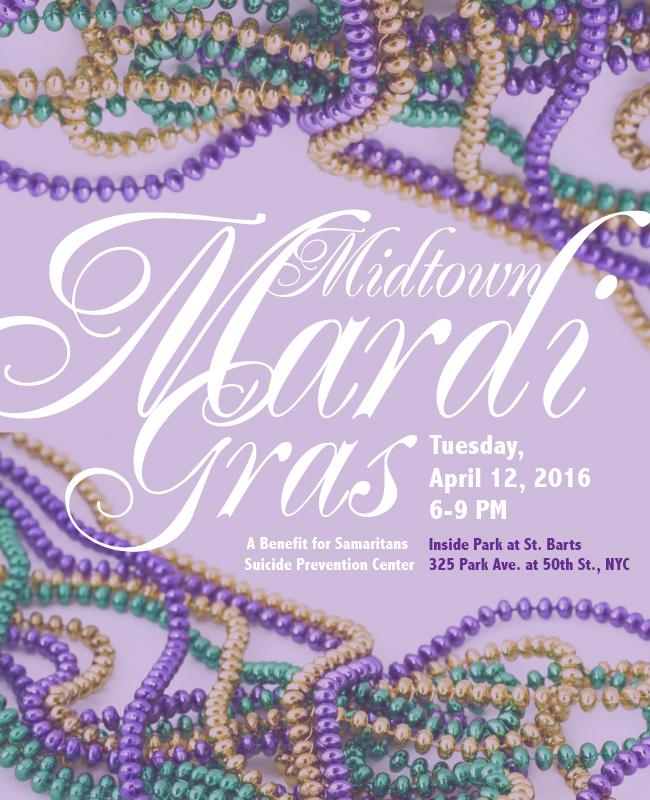 The gala will support efforts to help people in distress during their difficult times. 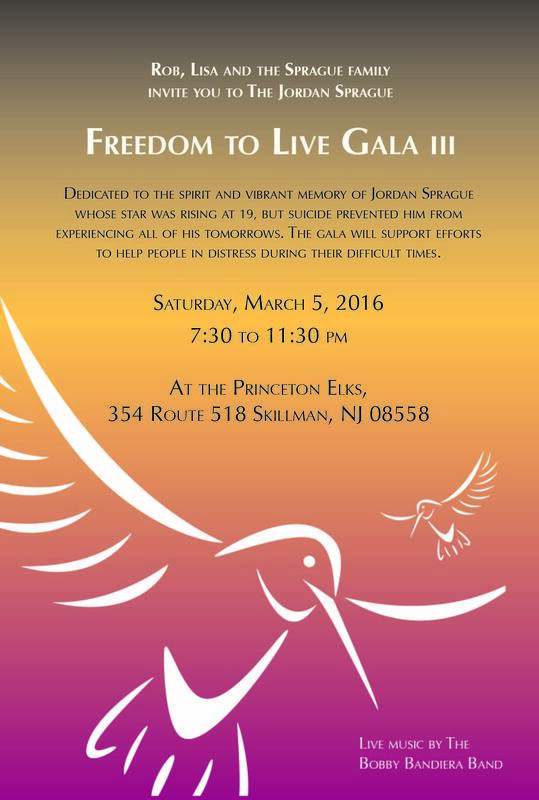 The gala will take place from 7:30pm-11:30pm on Saturday, March 5, 2016 at the Princeton Elks in Skillman, New Jersey.